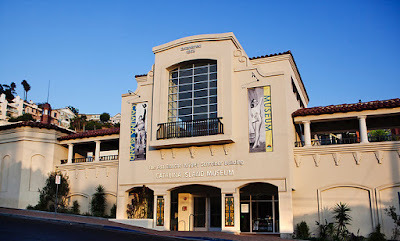 A special 100th Anniversary Screening of Houdini's The Grim Game will take place at the Catalina Island Museum on Friday, May 17 at 7pm. The film will be screened in the museum's magnificent outdoor amphitheater and will feature live musical accompaniment by acclaimed composer and musician Michael Mortilla (who last year accompanied a screening of Terror Island). I will also be on hand to introduce the film. Below are details. Celebrate the 100th anniversary of Harry Houdini's 1919 film, The Grim Game during an outdoor screening in our Ackerman Family Amphitheater. The film will feature live musical accompaniment by acclaimed composer and musician Michael Mortilla (who will accompany our annual Silent Film Benefit the following day). Houdini expert John Cox will introduce the film. The Grim Game is a silent drama that showcases Houdini's talents as an escapologist, stunt performer and aviator. In the film, a gang of men frame Houdini's character for murder and kidnap his fiancée. Houdini is falsely imprisoned by the police for the crime. Shortly afterward, he escapes and pursues the men who framed him. The film unfolds as a series of Houdini's trademark stunts and escapes; his tormentors chain him up and imprison him on numerous occasions, only for Houdini to escape. The film concludes with a climactic mid-air collision following an airplane pursuit. Following the collision, Houdini is reunited with his fiancée. The film was considered lost until for decades until it was recently discovered. It was restored and first shown again in 2015. A specialty cocktail, wine, beer, soda and water will be available for purchase. As a bonus, you'll be able to see the museum's new Houdini display in their permanent exhibition on Catalina Island history. The display includes unseen footage from Houdini's Terror Island, which was filmed on Catalina in November of 1919. This is also the weekend of the annual Art Deco Ball and Silent Film Benefit, which this year features a screening of Colleen Moore's Why Be Good? in the famous Avalon Casino Theater. This is always a big weekend on the island and hotels fill up fast, so if you want to attend The Grim Game 100th Anniversary Screening, I would make plans soon.